To bleed or to succeed? The discount airfare gamble. It’s that period of the year again, when SpiceJet decides to roll out attractive fares to fill otherwise empty seats on board its airplanes. For travel between the second half of February till 15th April 2014, SpiceJet offers a 50% discount on the base fare and fuel surcharge (which constitute most of the airfare), on limited seats on direct flights. Other airlines have followed the airline-in-the-red. This is perceived as a much better move when compared to what was done last year (2013), when the airline was under the reigns of Neil Mills. A flat fare of INR 2013 was offered, irrespective of the sector length. This time around, the fare, though discounted, is in sync with the sector. The airline has been careful in offering very few such seats on flights that always assure a good demand: the early morning and late evening /night flights between metros. Apparently, this move from this airline has been “well calibrated”, and the airline has “learnt from its mistakes”. Last year’s offer did not help much, with the overall load factors. 1. Unplanned travelers, smitten by the offer, pick up those 19 seats, while those business travelers who would have anyways paid regular fares and flown, may pick up the remaining 170 seats. But if the ticket fares, which shoot up due to higher perceived demand, is still applicable, an estimated 5-10 seats may remain empty. The airline makes money. 2. Planned travelers, who were yet to book their tickets, pick up the19 tickets, making the remaining, regular fare seats unattractive for unplanned travelers. This will still leave 19 seats empty. The airline loses money. Practically, it may be a mix between options 1 and 2, leaving the carrier between 0 – 9 extra paying passengers. In this example, the incremental load factor is between 0% and 7%. On sectors that do not usually attract good load factors, the stakes are much higher. 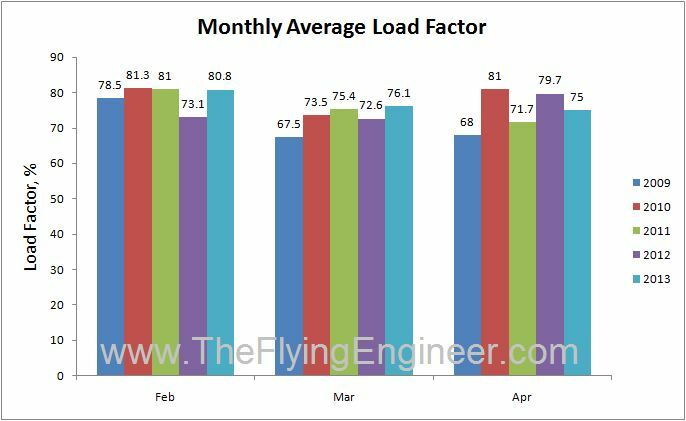 Note that when SpiceJet came out with its offer last year, the months of February and March recorded higher average load factors compared to those in 2012, but the month of April did worse than in 2012. With Go Air, Air India, and IndiGo offering similar airfares, the potential growth in passengers in this 2 month period is distributed. Will the gamble make airlines bleed or succeed? To be seen.